If you have a pool on your property, it’s no surprise if your place becomes popular all of a sudden over the Christmas holidays. Old, rigid cement based pool paving surrounds are susceptible to cracking, water ingress and further erosion. Stone and Polyurethane are both waterproof, meaning StoneSet Permeable paving does not experience the same puddles, erosion and cracking. Read more! Typically, when home buyers acquire a property with a pool, they are looking at pavers or Pebblecrete surrounds. 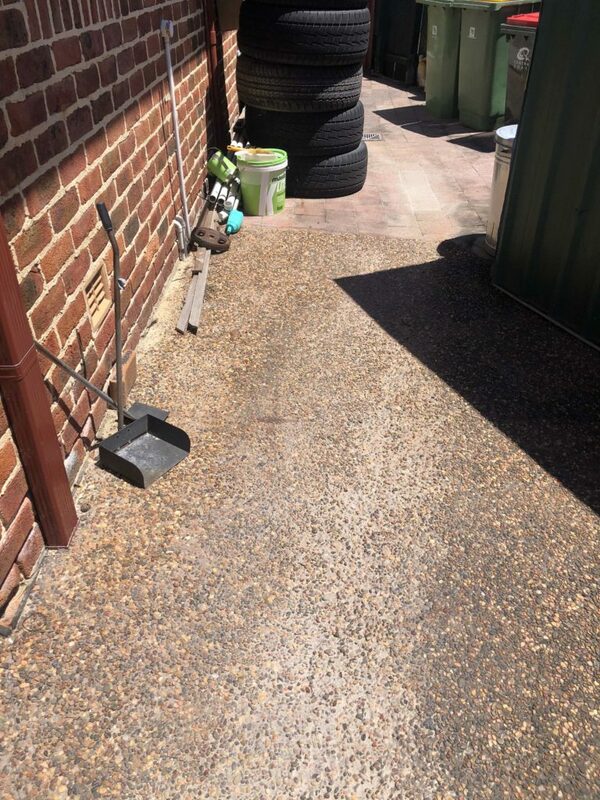 For most properties, the pool area has seen seen significant use over the years, with loose pebble or cracked pavers often the result. 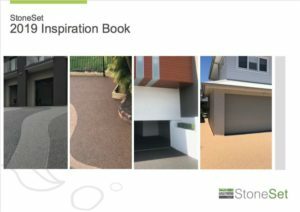 Pebblecrete and Pavers were popular through the 80s and 90s and these hard surfaces were chosen for their durability under harsh UV and Chlorine / Salt conditions. They are also non slip which was one of the main criteria for safety in these areas. Pebblecrete was one of the most common pool surrounds and often matched to the interior pebble look. Pebbles were used primarily because the look of natural stone compliments the outdoor pool area in keeping with a natural outdoor environment. Pavers on the other hand have always been popular primarily due to their durability outdoors. 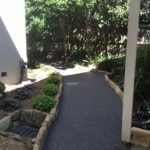 However being lower cost than Pebblecrete and with a similar standard of non slip surface, pavers were often used instead of or alongside Pebblecrete pool surrounds. 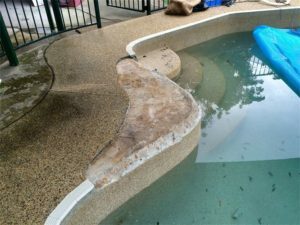 Pools surrounds need to take significant wear and tear. Considering 10+ years of UV, chlorine and Salt water exposure . Pool surrounds also take a beating from puddles and foot traffic. 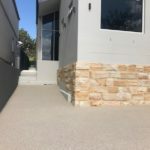 Cement based stone like pebblecrete suffer significant erosion over the years due to puddles and foot traffic erosion. Whilst natural pebble stone is highly durable absorbing UV, any exposed cement will weaken over time. Just like a pot hole forming, puddles form in the areas that experience the most foot traffic. In other words, splashing and foot traffic happen at the pool in at time most erosion occurs. 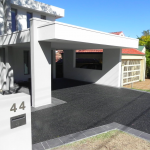 Pavers are similarly durable as stone, they take the brunt of the UV and foot traffic. Whilst they don’t suffer the same erosion of the water-soluble adhesive like cement, they are prone to cracking. 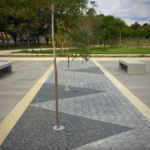 Once a paver cracks, it quickly becomes prone to water ingress and further erosion. Porcelain Pool Pavers – Advantages due to lack of need to reseal the impervious surface. Travertine Pool Paving – A more natural limestone texture, needs to be re-sealed often. Granite Pool paving – A more premium option to travertine also requiring sealing maintenance. 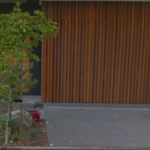 Timber Decks – Less expensive however prone to ingress and warping. Need re-sealing and Merbau timber sustainability is questionable. Artificial Turf – Great for looking natural. Lower quality colours can fade due to chlorine etc. On top of all the bullet points above, StoneSet is ideal for Pools due to its porosity. 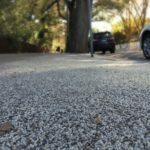 Porosity – Non Slip, no puddles, no erosion, no attracting bugs / mosquitos breeding. Stone is Waterproof and doesn’t degrade with water exposure. shade of the top level of stone. All the above pool surround surfaces are rigid and are susceptible to water ingress and wear. As the image shows below, cement is a solid mass of concrete with overlaid aggregate like pebble. Cracks tend to travel in solid rigid bodies, leading to more water ingress and destabilisation of the cement based adhesive or render. 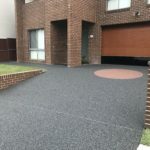 StoneSet’s blend of stone and polyurethane resin does a far better job of conserving and preserving it than concrete, due to its permeable nature. Similarly pavers are a solid mass of rigid hard material. Resin bound stone can with stand this cracking as there is more flexibility in the multiple number of bonds that form between the stone. Flexibility is achieved as some bonds can break whilst keeping the surface appearance similar. 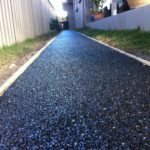 Consider you could go back in time to when the existing concrete or paving was laid 10 – 20 years ago. The area would have looked entirely new and inspired endless summer days relaxing by the pool. Now consider any potential buyers of your current property. Would they look at your pool in the same way? Or must they consider the time and costs of remedial options for any cracked or worn areas? When looking to sell a property, painting, both internal and external is one of the lowest cost, quickest, highest value improvements you can make before you sell. 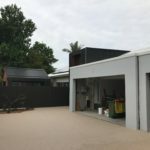 See the photo gallery below of a recent transformation of pool surrounds at the Central Coast in NSW. 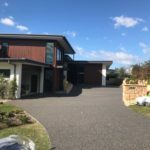 Resin bound stone overlay is like painting for your pool surrounds – Considering any cost of removing pavers, Stone overlay is a high value, premium result which breathes the original life back into your pool area.